Synopsis: In “Banished to Outer Space”, we find Rick Jones standing vigil over the Hulk as he’s kept prisoner in the specially designed holding facility designed by Bruce Banner. As Rick leaves for the night, he’s confronted by a group of soldiers who say that they’ve been looking for him. After bringing him to General Ross, the General explains to Rick that the military needs the Hulk to passenger an experimental rocket since he was the only known being that could withstand the g-forces. After mulling it over, Rick decides that it’s too important to national security, so he goes to release the Hulk. Before he can fully release the giant hydraulic press that holds the door in place, the Hulk destroys it in a rage and lumbers after Rick, seeking revenge. Rick succeeds in luring the Hulk into the rocket and it is instantly launched. As the Hulk is rocketing through space, he transforms back to Banner after being bathed in sunlight, but is irradiated when the ship passes through a radiation belt. Rick learns that it was all a trick to get rid of the Hulk forever and decides he has to save him since Ross doesn’t realize that the Hulk is actually Banner. When attempting to operate the controls that will return the rocket, a strange electric current connects Rick to the ship. Thinking that it will be Banner in the return capsule since its daytime, Rick believes he’s killed Banner when the capsule crashes. Suddenly, and to Rick’s astonishment, the Hulk rips through the capsule and instantly seeks to attack him, but after yelling “stop!” as a plea for mercy, the Hulk stops cold. Rick learns that he now has complete control over the Hulk as long as he stays awake. After the Hulk goes on a mini-rampage in a small nearby town, Rick leads him back to the holding facility and leans back on the wall, trying with all his might to stay awake so the Hulk won’t escape. After a brief recounting of the Hulk’s origin, we’re introduced to the Ringmaster and his Circus of Crime. After the Ringmaster uses his hypnotic abilities to hypnotize the circus audience, and then the entire town, the villains make off with all the valuables that they can carry. Unbeknownst to the Ringmaster, two FBI agents are hot on his trail. The scene shifts to Rick Jones, who having managed to stay up all night without falling asleep, makes his way to his Aunt Polly’s house to refresh himself. On his way back, Rick notices an ad for the Circus and decides to attend. Unfortunately, Rick is unaware that this just happens to be the Circus of Crime and is hypnotized right along with the rest of the crowd, but manages to call to the Hulk before he completely goes under the effects of the hypnosis. The Hulk arrives, and after a brief altercation with the Circus, he’s seemingly captured and put in chains, but is only unable to act because of Rick’s state. The Ringmaster decides to display him as one of the attractions and makes for the next town. During the next performance, Rick Jones, along with the FBI agents arrive, and at the sound of Rick’s voice, the Hulk easily snaps the chains and goes on a rampage. He gets his hands on the Ringmaster, but is prevented from hurting him by Rick. Suddenly General Thunderbolt Ross appears with his soldiers and our stories ends when Rick commands the Hulk to leap away. Comments: A strange but interesting issue, it seems like another Hulk tale that could have easily been split into two standalone twelve-pagers. 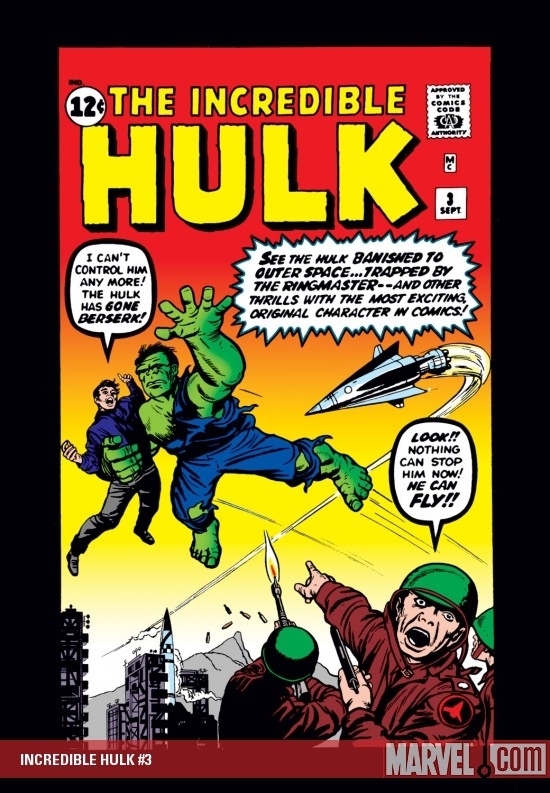 The “Remote Controlled Hulk” idea is kinda odd and it seems to indicate that Stan and Jack still couldn't figure out the Hulk’s angle. Maybe the thought was that the Hulk at that point wasn't very interesting and Rick Jones needed to be brought to the forefront to give the reader more to relate to? We do get the very interesting debut of the Hulk’s “leaping” ability. Much has been made of the fact that Kirby seems to have been drawing the Hulk flying as opposed to leaping. The cover certainly seems to indicate this. If it was Stan that decided after-the-fact that super-leaping made more sense, I have to say that I agree wholeheartedly. The Ringmaster and his evil circus was...okay, but he was never a credible threat. Certainly not for the Hulk It's clear that all the good ideas are getting saved for the FF at this point. Stan’s writing still isn't as interesting as it is on FF, but he does a serviceable job. Kirby and Ayers, however, do a great job on the art. I particularly love the opening splash page of the Hulk banging away inside his prison. Characters Development: We certainly get to know Rick a bit more, to the point that we find out that he has an aunt and her name is Polly. The Hulk’s few lines seem to foreshadow the “Hulk Smash!” era, if only dimly, but there’s really no indication of what the Hulk’s personality is yet. General Ross really comes off as an even bigger SOB than we've seen so far, with his underhanded plan to get rid of the Hulk. Personal Rating/Historical Importance: 5/7. All things considered a very average story. Unlike the FF with Doom, the Hulk has no major supervillain nemesis yet, so we’re seeing the limitations of the Hulk/Banner vs clueless military angle. I love Ross as a character, but the mythos needs more than just him and a military base to really take off. I give this issue a much higher rating than I otherwise would simply because of the debut of his now iconic leaping ability. Stan and Jack had absolutely no idea what to do with The Hulk. The status quo changed every issue of the original run. And Kirby was clearly drawing The Hulk as flying. You can't swoop in and pull someone from a jeep while you're jumping. Again, it simply goes to show they were flailing about trying to find something that would work. ...here's some Sinnott trivia. After the great work Sinnott did on #5 Stan wanted Sinnott to stick with the FF, and Joe did ink a few panels of #6...but he ultimately had to beg off due to another (probably more lucrative ) job from another comics company. I always thought it was interesting that although Sinnott's own drawing style is much more realistic than Kirby's, he seemed to be the first inker who was really comfortable and effective accentuating Jack's stylistic tendencies. Not THAT much more realistic - he's not Kirby cartoony, but he's closer to Kurtzman than to Hal Foster. I was thinking more of his work for Dell or Treasure Chest. Unlike the Thing, the Hulk isn't a very sympathetic character in his origin issue. In fact, he’s downright sinister at times. This had a lot to do with the initial conception of the Banner/Hulk dynamic being a modern day Jekyll and Hyde and perhaps it had a bit to do with Stan and Jack not yet being certain that the Hulk would work as a monstrous anti-hero. Rick Jones comes off as your typical rebellious, but instantly loyal to anyone who shows him kindness, troubled youth and Betty is portrayed as little more than a fawning, fainting, willow. To her credit, she’s the most perceptive of any of the supporting characters, particularly pertaining to the Hulk. Thunderbolt Ross is handled well in his initial appearance; you can clearly see his disdain for intellectuals in his instant dislike of Banner and his equally instant hatred of the Hulk illustrates his inability to tolerate personalities or situations that he can't dominate and control. It's also worth mentioning that there's no suggestion that Betty and Banner are seeing each other in the first issue, so General Ross' sneering dislike of Banner doesn't even carry the motivation that he's wary of his daughter dating a "weakling." Only with the second issue are they exchanging brief intimate moments. I think I remember Rick scornfully thinking something like, "Oh, it's 'Betty' now. Yuck." I tend to credit Stan for coming up with characters who were enemies of the main heroes without being actual villains, principally Ross and Jonah Jameson. I'm not going to say that Kirby and Ditko never did anything similar, but I can't even think of too many similar characters in superhero comics at all-- maybe McGonigle, a goofy cop who tried to catch Golden Age Batman a couple of times before said cop disappeared into the ether. These sort of non-villainous "blocking characters" (as one literary critic called them) seem to come out of the tradition of comedy, and would be familiar to Archie Comics readers with heavy handed teachers like Miss Grundy and Mr. Weatherbee. I imagine Lee created a few such characters for Timely, though I must admit my knowledge of Lee's Timely work is marginal. Such beautiful work there. And yeah, the other job that displaced FF #6 was for Treasure Chest; as Sinnott put it, he'd already promised to produce "65 pages on Pope John the 23rd...pencils and inks" (TJKC #60 again). No, that Rick line is actually in issue #1. And to me it looks like Betty and Bruce seem to have an attraction in that very first issue, at least the way Kirby draws them (body language) in that particular scene with Rick. I'm going to be reviewing Journey Into Mystery and Tales to Astonish here shortly (first superhero appearance of Ant-Man!). I planned on doing some more yesterday, but I pulled my back a bit at work so I was a bit preoccupied. I don't have anything to do this weekend, so my goal is to get as much reading in as possible. I want to pick up the pace to get to early 1966 ASAP. Beyond Spider-Man, Hulk, FF and Thor, I haven't read most of that stuff in chronological order, not even Avengers and X-Men. FYI, I'm using a combination of my Epic's Collection, Marvel Unlimited, GIT Corp Marvel DVD's and a few Omnibus'. I thought it would be fun to switch back and forth between different formats (paperback, hardcover, digital). For instance, I have Vol.2 of the FF Omnibus and the Silver Surfer Omnibus. When I get to those issues, I'll switch over to those collections. I have to say, I'm finding it very interesting reading these comics like this. I'm going to try to shorten and tighten up the synopsis portion of the reviews. Many here have read these issues already and the most fun part about these reviews is making my own comments and observations. I know thats what I like best about the other threads. Synopsis: Our story opens with a brief retelling of Thor's origin, and after we're introduced to Jane Nelson, Don Blake joins a team of physicians who are being sent to the country of San Diablo to aid the sick. San Diablo is a war torn land being fought over by democratic forces and communist forces lead by a ruthless dictator known as the Executioner. The Executioner's forces attempt to prevent the doctor's from reaching San Diablo, but Blake changes into Thor and destroys the attacking jet planes. After reaching the country, the doctors are once again attacked, but Thor again thwarts their efforts by causing a thunderstorm and then takes out their tanks. The communists manage to capture Jane and Thor is forced to yield. Thor skulks off to change back into Blake and is captured while trying to rescue Jane. The Executioner takes his cane and orders him to the firing wall, but Jane pleads for his life. 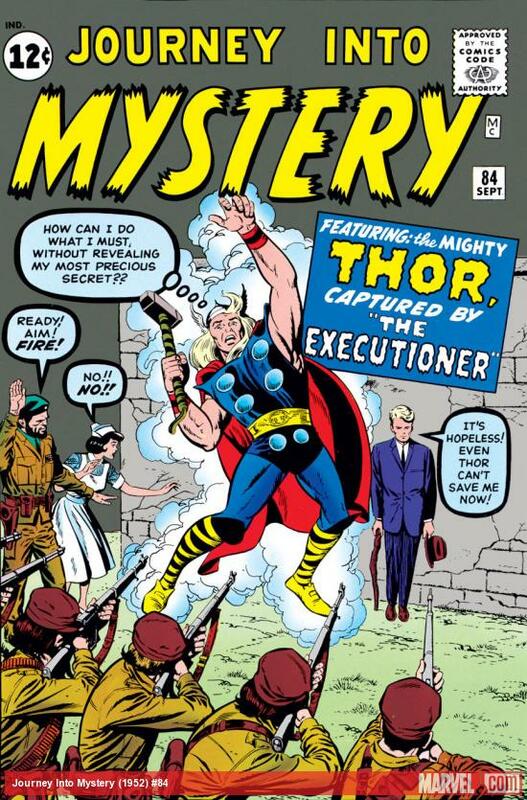 The Executioner attempts to bribe Jane into marrying him by sparing Blake's life, but Blake calls him a coward and after regaining his cane, he changes into Thor and thwarts the fleeing soldiers by causing the volcano they were attempting to retreat to to erupt with a lighting bolt. In the confusion the Executioner attempts to make out with all the gold and cash, but is killed by his own men right in front of the firing wall. Blake, Jane and the other doctors are then able to treat the sick after the democratic forces take over. Comments: I've never really liked Thor stories that didn't involve Asgard (or some other magical realm) or his most interesting super-villains. This early story pitting him against communist forces was heavy handed to say the least and didn't capitalize on the strengths of Thor's expansive mythological based mythos (Granted most of it hadn't been introduced yet.). One thing's for certain, we're never allowed to forget how "lame" Don Blake is. Stan writes nothing of note in this issue as it's typical of the pro-capitalist stories being done during this period. Kirby and Ayers turn in some solid art, though Thor is looking a bit lean in these early appearances. His look will improve over time as Kirby evolves his look to the more muscular version we're used to. Character Development: The introduction of Jane was certainly a major development to the series and added an extra layer to Blake that wasn't present in his first appearance. For me, Blake becomes somewhat superfluous once Thor starts hanging around Asgard (as Walt Simonson seemed to think) but in these early issues the tragic love story of Blake and Jane was probably needed. Personal Rating/Historical Importance: 4/7. I just really dislike these kinds of stories in Thor comics. It's probably a little better than my personal rating, but I just can't help but view it as anything other than a sub-par Thor story. Jane's debut is the first major addition to the series and it certainly makes this issue far more important than it otherwise would have been. That issue of JIM was plotted by Stan Lee, scripted by Larry Lieber. Mike's site has it listed as simply being written by Stan Lee. The Marvel site has it written by Larry Lieber, but no mention of Stan plotting. Thanks for the heads up, Slam. I generally check the GCD. Mike's site is great. But the level of scholarship at the GCD is as good as there is on the net. I think Thor really comes off as a Superman copy in those early stories... from fighting Commies to helping with missile testing and whatnot... I doubt he would have become one of Marvel's staple characters without the mythology that eventually gave the series it's direction.